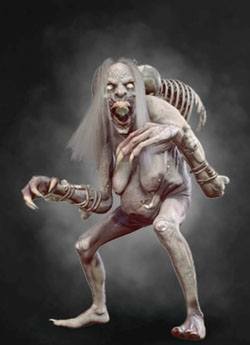 Grave Hag is an Creature/Monster in The Witcher 3: Wild Hunt. Few monsters' names fit as well as the grave hags'. As one might guess, these creatures resemble aged, deformed women and loiter near graveyards and battlefields. Grave hags feed on human corpses and in particular on the rotten marrow which they slurp from human bones using their long, prehensile tongues. Once a hag has devoured all corpses within reach, she turns to killing men and burying them in the cemetery as she waits for them to decompose." Attacks: Quick and deft, slashes as enemies with poisonouos tongue. Can inflict blindness. Strengths: Strong in melee range. Fast and deadly. You can cut off a grave hag's tongue while counterattacking. Then she won't be able to poison you.